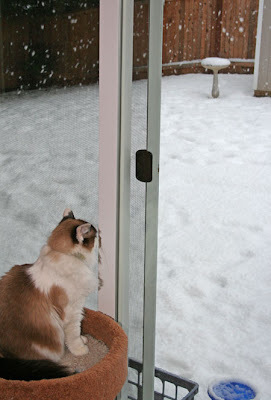 Even the cats are a bit sick of the uncharacteristic Seattle snow. It snowed most of last week and we definitely had a white Christmas. And though it is warmer today and I was able to make a pretty decent sized snowman with the wet snow, it has started snowing yet again. We have an SUV with all-wheel drive, so I have had pretty good luck getting around. the hardest place I've found to drive is the local Safeway parking lot. They chose not to plow it and the throngs of people trying to stock up on supplies (you can't risk being snowed in without a decent supply of pork rinds...which gives you some idea of the clientele at this Safeway) are spinning around the parking lot in their little sedans with the one door a different color from the rest (another clue to the locals) skidding sideways into anything resembling a parking space. I have to tell you I grew up in a place that snowed regularly every winter and you had no choice but to drive in it. But I cringe every time I hear someone pontificate about being fine driving in the snow but "it's all those other people" that freak them out. No one is good at driving in snow. They are just lucky. Now that the snow is supposedly melting (though it is still coming down hard here), the news has started warning of the dreaded "urban flooding." This is known in the entertainment news business as a "dramatic hook." They didn't name this year's storms as they did in the past (like Storm watch 2008 or Tempest 2008). So they need to conjure up a new way to engage people and get them started building arks in their garages to ride out the "Urban Flooding 2008." They do give tips on avoiding urban flooding -- clean the snow off the top of storm drains. Thank god the research department at the local networks were able to Google that little tidbit of hope for us all. Oh well, at least the snow man is smiling (until his rock teeth start dropping out due to the urban flooding).